Lourdes joined the HLC Academy for Persistence and Completion in 2014. Assessment of student learning is key to the University’s mission, guiding principles, values, and focus on continuous improvement. In accordance with best practice, the University maintains a comprehensive assessment plan, including assessments at the institutional, program, and course levels. Conducts accreditation activities related to the Institution as a whole. Participates in accreditation of programs and archives specialized accreditation in central location. Chooses Assurance Argument Team and provides leadership. Organizes Assessment of Strategic Plan Objectives and reports on progress annually. Guides, and collaborates with, the Faculty Senate Assessment Committee. Collaborates with the Assistant Vice President of Institutional Planning to collect and interpret assessment data. Maintains assessment web and portal pages to facilitate faculty, staff, and administrative assessment activities. Facilitates assessment education events and activities to promote a culture of streamlined, engaged, and relevant assessment. 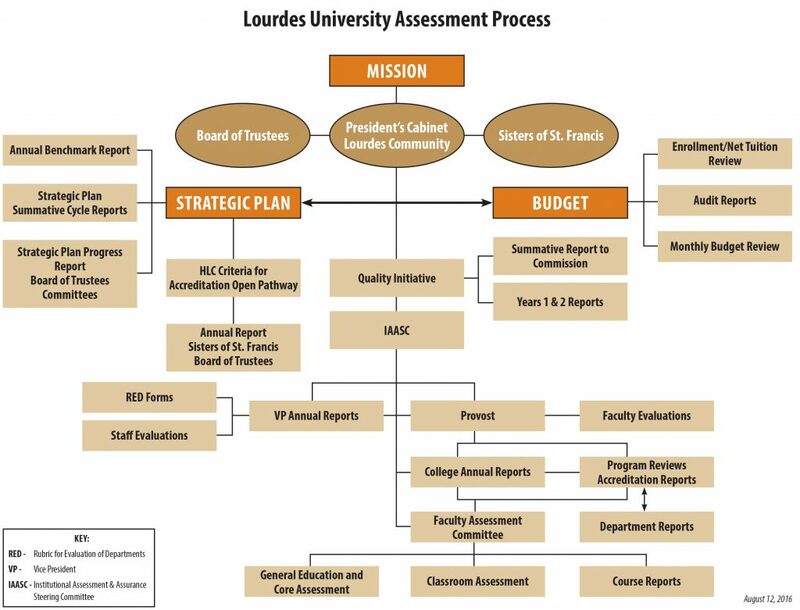 Trains interested faculty and staff on assessment so that Lourdes University always has a cadre of knowledgeable and functional assessment personnel. Provides professional development credit for faculty who pursue assessment education and assessment activities for Lourdes University. To provide a broader context for assessing learning and student engagement at the Institutional level, the University participates in the National Survey of Student Engagement every three years. Results provide a vehicle for examining and improving students’ learning experiences in light of empirically confirmed “good practices” in undergraduate education. Data on graduating student’s perceptions of their skills and knowledge in the University Learning Outcome areas and the effect their learning experiences at Lourdes University had on the development of those skill and knowledge are also collected and reviewed annually. The Faculty Assessment Committee plans and coordinates assessment of Undergraduate University Leaning Outcomes, facilitating alignment of academic assessment processes at the course, program, and institutional levels. The Gen Ed/Core subcommittee oversees the ongoing implementation of the Core Curriculum to assure integration with General Education and to prevent curricular drift. This subcommittee also provides guidance in assessing learning outcomes achieved through the Core and General Education. A subcommittee assists in establishing themes presented in the First Year Experience and Enduring Questions seminars and tracks methods for service learning and cultural diversity experiences. 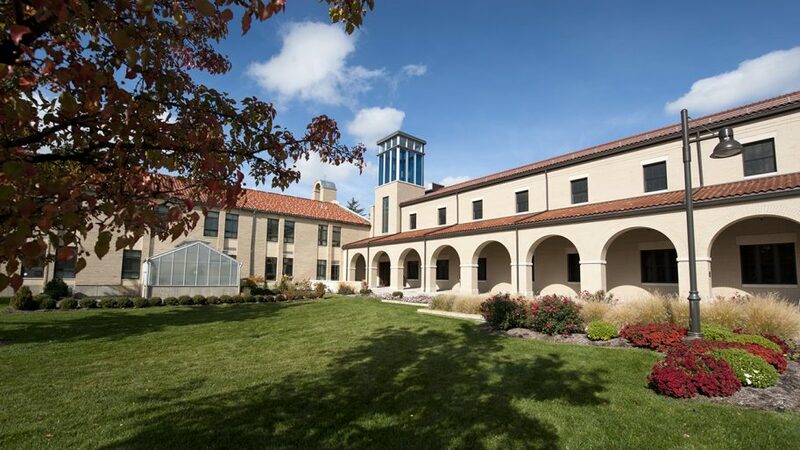 At the program level, the University conducts a Program Review on every academic program during a five year cycle, with updates submitted annually. Academic and student life programs involved in student learning have program missions, student learning outcomes, and plans for assessing program learning outcomes. The missions are aligned to the University’s mission, and the outcomes are aligned to the University’s Learning Outcomes. Program Learning Outcomes are assessed in a variety of ways, including course-embedded methods, student portfolios, capstone projects/ experiences, student productions, and surveys of alumni. Departments analyze and use assessment data to help them improve student learning and ensure program quality. At the course level, outlines listing University Learning Outcomes, Program Learning Outcomes (if applicable), and the specific course objectives linked to those outcomes provide a foundation for assessment of student learning. Faculty complete course report forms at the end of every semester, analyzing the extent of student learning related to the University Learning Outcomes, Program Learning Outcomes, and course objectives for the course. On the course report form, faculty also suggest ways to improve student learning in the course. These forms are collected and reviewed by department chairs, who strategize with faculty about changes to enhance student learning and increase achievement at the course level. All non-academic departments are assessed through the RED forms annually. The Rubrics for Evaluating Departments identify the core elements needed for effective operations, including mission, department goals, measurable outcomes, data sources or activities, planning, budgeting, and improvement.